This wine is almost everything I love about Sonoma Coast Syrah. It’s got this wonderful energetic core of fresh fruit and a smooth and rich mid-palate with a nice lift of acid on the finish. At least, it mostly does after the oak blows off. On initial opening this wine was too oaky for me. Not sure why, since it only sees 25% new French oak but I was getting a little too much vanilla and baking spice and not enough pure fruit. The fruit was there but I couldn’t find it for the oak. As the wine opened, that core of fruit crept back in — ripe blackberry aromas mixed with green cracked pepper and a bit of smoke and also some plum began to come through. This is more of a brawny style of Syrah, it’s big and bold and it packs a punch. I wouldn’t call it anything close to a Northern Rhone (at least the ones I’ve tried) but it does have some of those same cool-climate characteristics in that there’s a savory element to it. It’s a well-made wine if perhaps a bit too “large” for my taste. For those of you that like bigger styles of Syrah though, this would be right up your alley. Charles Heintz is perhaps most well known for the spectacular Chardonnay and Pinot Noir vineyards of which there are roughly 40 combined acres that he farms and sells to some of the West Coast’s most premium wineries. 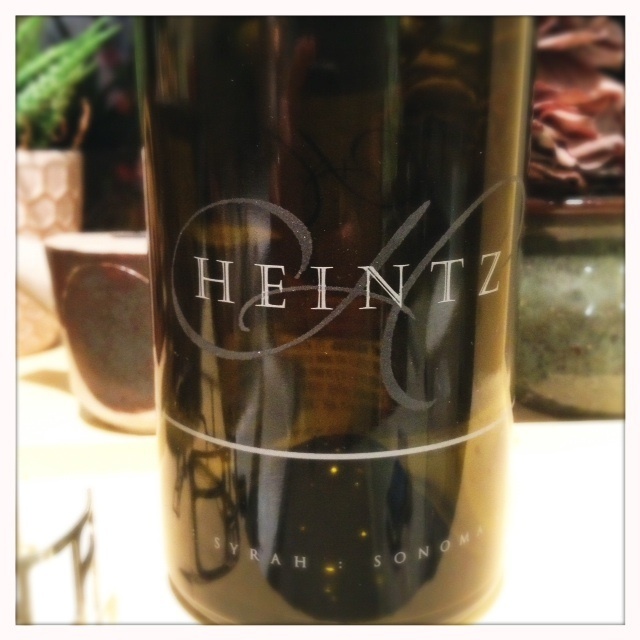 But the Heintz family started their own winery back in 2000 and have been making a their own Pinot, Syrah, and Chardonnay from their estate grapes. There’s only a little bit of the Syrah (about 3 acres). It’s grown in the lowest part of the Heintz ranch where the fog settles in and keeps temperatures nice and cool. Over all, I’m sure that there are many who would find this Syrah right up their alley, it’s close for me and I will go back to try other vintages. This is a wine that I’ve been really looking forward to trying. And I can’t think of a better one to exemplify non-Californian cool-climate Syrah. The Northern Rhone is, after all, the birthplace of Syrah and still represents the pinnacle of this style of the variety. The Clusel-Roch came as a Christmas gift from my wife and although I’ve had a few Côte-Rôties, I’m looking forward to really delving into this one to find out what it’s all about. Part of the unintended outcome of this blog has been the realization that the more you write about a subject, the more you learn. The Northern Rhone wines that I’ve tried in the past have all been delicious but I haven’t taken extensive notes on them or really learned about the stories behind them. It’s time to change that. Day 1: On the nose this wine has a beautiful salted plum aroma with notes of pepper and gravel. Initially it’s smooth on the palate but transitions to some pretty intense acidity. There’s a verve and energy with this wine. It’s a fresh wine, and one that could cellar for a while. The finish is dry and bright with a lingering acidity that makes you crave another sip or a bite of rich cheese. Day 2: One night sitting on the counter with the cork in has allowed the Clusel-Roch to really emerge. It seems to be a darker and richer wine. I’m getting similar aromas but also a hint of dark licorice and leather. The midpalate and the finish have mellowed immensely making the wine richer and smoother and a little less angular. If this is a hint as to what the wine might develop into after a few years of age, then I’m intrigued. It’s delicious. Made from Syrah vines grown on steep hillsides, this is a cuvee made from a mix of the older and younger vines in the Clusel-Roch holdings. These vineyards are farmed in a traditional way, without the use of pesticides or any chemical additions whatsoever. Most of the farmwork is done by hand, which the farmers believe adds to the authenticity of the wines. According to my most informative guide book to the Northern Rhone, The Wines of the Northern Rhone by Jonathan Livingston-Learmouth, the winery’s owners Gilbert Clusel and Brigitte Roch believed that a purity in their wine could be achieved by farming organically and with traditional methods. 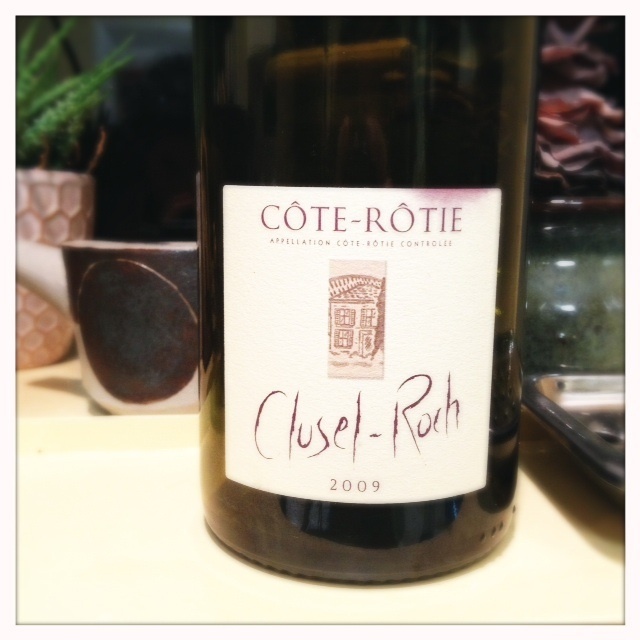 Many Côte Rôtie wines are traditionally made with a little Viognier and this wine is too (just 4%), although it’s hard to parse out any of the usual floral aromas that can come from Viognier. The Classique is made by traditional foot stomping and some whole cluster fermentation, depending on the vintage. The wine sees 20% new oak and is aged in the barrel for two years. I’m very impressed with this wine and hope to taste more Côte-Rôties from perhaps more modern wineries so that I can compare them. It’s a beautiful wine and could be the beginning of a new obsession. If only it were cheaper. This is my second vintage of Matello Syrah and there are few syrahs that I can say are more pinot-like than the two Matellos I’ve had. Right away, you can tell by the lighter color that these syrahs are not big and brawny—they’re elegant and feminine and light on their feet. The 2010 came out of the bottle promising more intense fruit on the nose than the ’09 I had tasted previously. Some of the deep strawberry and cherry aroma blew off right away and gave way to similar floral characteristics that I got on the ’09, which could be explained by the viognier addition. On the other hand, it could be a characteristic of syrah from this vineyard. I’m usually not so good at sussing out which flowers I smell in wine but this one is unmistakably honeysuckle. I didn’t get as many savory aromas on this wine as I got on the ’09 but I definitely got a fair amount of forest floor. It’s so light on the palate and has a nice acidity and lift that’s not harsh or tannic. And the finish has bright strawberry flavors but it’s not sour or harsh. I saved a glass of this wine for the second day to see how it evolved and it remained fresh in the glass and full of those same floral and fruit aromas as the day before. Some of the savory aromas came out a bit more and I got that same salty plum flavor that I loved on the ’09. On day two, it was more rounded on the palate and the finish. I think this is a wine that would age beautifully—much like a Burgundian style pinot or a Northern Rhone syrah—because of its core of acidity. 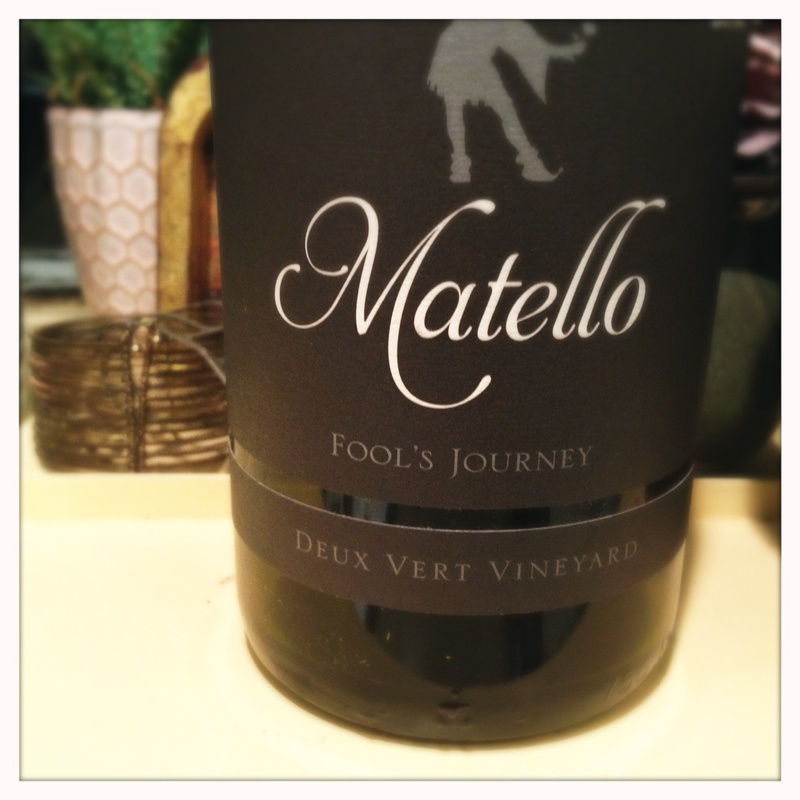 Matello’s winemaker Marcus Goodfellow has a deft touch with syrah and really knows how to handle the fruit from this particular vineyard. Which is to say he knows that the grapes need very little in the way of handling. Marcus brings the fruit in, doesn’t de-stem, lets it ferment without cold stabilization or added yeast and crushes it by foot. The resulting juice is aged for 23 months in neutral oak. Although the wines are picked at relatively low brix, Marcus thinks that the moisture-absent vineyards from this location allow the grapes to reach full phenological (or aromatic) ripeness without letting the grapes get too high in alcohol. The resulting wine is a feminine and elegant wine that’s not for the cabernet-set, but if you like pinot and want to see what syrah is capable of when grown in a truly cool-climate environment, this is a wine you have to seek out. This wine was provided as a sample for review purposes.